Magic Dice has been down for one day. Their users on their discord are demanding explanation but no comment from @magicdice developers yet. Users are suspecting it is scam. So unless @magicdice makes a statement - we would like to warn the users of their services to take precaution. Best would be stop playing till they issue detailed explanation. Rest is your judgement call. 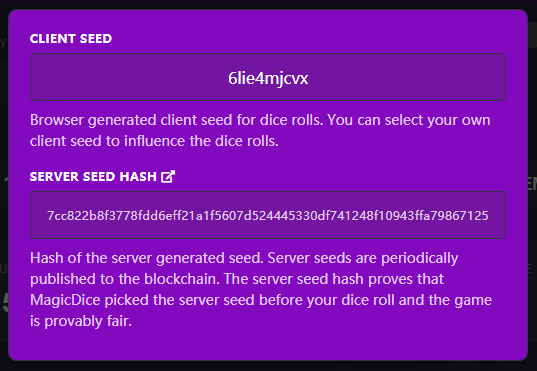 The @magicdice bot is up, and working completely fine! If you're wanting to still play, you can do so manually and shouldn't encounter any problems. I did a few rolls today on Steemit, just by manually transferring Steem. would be an example bet. I don't think you should jump to any conclusions. It's nonsensical for it to be a scam; it's recent growth is massive, I don't see why you'd pick now to abandon it, and if so the account would surely be emptied and the bot wouldn't be working either. For now I'm going to continue doing a few rolls every now and then. I don't believe, for now, you really need to take any caution. Exactly, it doesnt make sense for it to be a scam because they dont actually hold anyone's money. How much money could they legitimately run away with? It's not like an exchange where they literally hold millions worth of crypto. You send crypto when you play and you get it back when you lose. If they stop stop rolling/sending rewards, everyone is going to stop playing after 2-3 attempts that didnt work. So what could they legitimately get away with before people notice? 10k Steem? That's nothing, they make almost that on a daily basis by running the game.